The Great and Legend Superstar Rajesh Khanna[1942-2012]. Rajesh Khanna(Jatin Khanna) dead at the age of 69 at his bungalow "Aashirwad" as he was sick from two months. 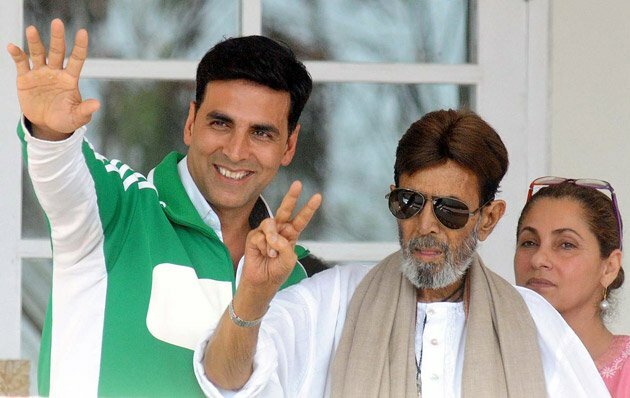 The veteran superstar Rajesh Khanna well known "Kaka" Passes away on 18-Jul-2012, Wednesday. 2 days ago, he was discharged from Lilavati hospital . That was third time in recent months that he was hospitalize for his kidney problem. His ex-wife Dimple Kapadiya are present on his last moments with two daughter's Rinke Khanna and Twinkle Khanna who was in last stage of pragnancy and with her son-in-law Akshay Kumar at their bumglow, Aashirwad at Carter Road, Mumbai. and his Physician and doctor is also present with them. On saturday Rajesh Khanna was admitted in Lilavati hospital and on monday he was discharged from the hospital in good condition. But today he had completely leave food and water and he will be suffer from grasping breath and dead at 11 am . as per bollywood buzz Rajesh Khanna had put his hand in Dimple Kapadia's hand at last moments and Dimple and Rinke Khanna was crying a lots on that time. 1970-1980 is the golden period of Rajesh Khanna . He had acted in 160+ movies and 100+ movies as a Hero. He had won 3 Filmfare Best Actor Awards, 4 BFJA Best Actor Awards. He entered in Bollywood movies in 1966 with the film "Aakhri Khat". Then his successful movies are give him a stardom in Bollywood Industries. These films are like Aradhana, Amar Prem, Kati Patang, Khamioshi, Raaz, Baharon Ke Sapne, Ittefaq, Bawarchi etc. His favorite dialogue is "Babu Moshai", "Pushpa"
He married Dimple Kapadia in March 1973, but the couple separated in 1984. His last successful TV serial on Doordarshan "Raghukul Reet Sada Chali Aayi" began in November 2008 and ended in September 2009. He was suffered from depression and he took lots of drunks of wine and alcohols in a day. So his liver was completely in bad condition in last weeks. words are less and his contributions in the film industries. he was a man of versatile personality. he acted film as he is living with his roles. his images are permanent in the memories of millions. he will be loved by all. god bless him.